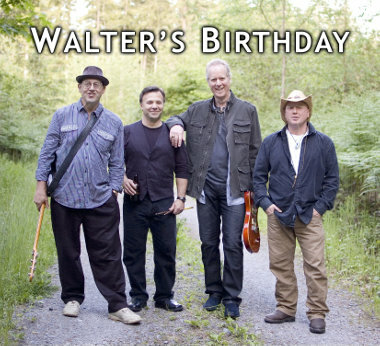 Wasn't last week end fun?...TWO very cool gigs....so much wonderful music... First, Friday's WALTER's BIRTHDAY CD Release Party at THE SPIRAL CAFE in Yelm went very well indeed with a packed crowd AND lots of CD's sold. A great sucess. That's TOD LEMKUHL/guitar/vocals, SCOTT ERCOLIANI/drums, JON BARONI/keys/harp/vocals and of course...STEVE BARTLETT/bass, as WALTER's BIRTHDAY. An awesome background video by SCOTT ERCOLIANI, opened the show as JON BARONI sang his DAKOTA RODEO...written by JON BARONI the late TED HALL, Steve reported that it was all very touching. Wish I could get there...soon folks. Go HERE to take a free listen to the CD or link to buy CD at CDBaby. Then, THE SHELLY ELY JAM in Spanaway on Sunday at UNCLE SAM's AMERICAN BAR AND GRILL...lots of fun, STEVE BARTLETT/bass was filling in for TERRY JAE/bass.... well, first we all know Ms. Bluzzz, vocalist SHELLY ELY's always a blast...and amazing JHO BLENIS was on guitar...WOW, What a great night of music. But,...the big surprise of the night was.....MARTIN SALINAS/guitar/vocals came into jam with these great musicans. This was the first sighting of SALINAS since the closing of his LIQUID SOUL COFFEE ROASTER's in McKenna on August 12th. He told Steve,,,he'll be in the area for about the next six months, then plans to return to his old home town of San Diago, CA. We'll miss you Martin. So, what's next?....On September 9th, a private gig THE BOW-WOW BASH in Olympia is set up with BARTLETT/bass playing again with that fine band, WALTER's BIRTHDAY. JON BARONI will be arranging all the details.